One key advantage of the 401(k) is the potential for tax benefits. There are two 401(k) types: a traditional 401(k) plan or a Roth 401(k) plan. The difference between these two is simply when taxes are paid1. Traditional 401(k): When you contribute to a traditional 401(k), you contribute from your income pre-tax. Taxes are paid when your money is withdrawn during retirement. Roth 401(k): When you contribute to a Roth 401(k), you contribute after taxes are paid. In other words, you’re paying taxes prior to when you contribute. Many employers encourage you to invest in your 401(k) by matching your contribution up to a certain percentage of your salary. If your employer offers this option, this is a great way to give your retirement savings a boost. Not all employers offer this option, but many companies will match employee contributions, however the percentage of the match can vary and is not the same for all companies. You should also check to see whether your employer offers profit sharing, as some companies share a percentage of profits into their employee 401(k) accounts. Be aware that some companies use their 401(k) benefits as a way of retaining their employees. The money in your 401(k) may not completely belong to you until you’ve worked for a few years at the company. There are other benefits of a 401(K) as well such as no income limits, and higher contribution limits per year than IRAs (up to $18,000 for 2017), according to the IRS2. Most aspects of a 401(k) are detailed by the specific employer, so be sure to know what your company’s precise incentives are in order to maximize your savings opportunities. IRAs, or individual retirement accounts, are similar to 401(k)s. However, IRAs are not employer-sponsored. These are accounts that you set up yourself with the help of an investment firm. Therefore, your investment choices are not limited to what’s available by a plan provider. You often have greater investment freedom with IRA accounts than with your employer-sponsored 401(k). IRAs can also be Roth or traditional. 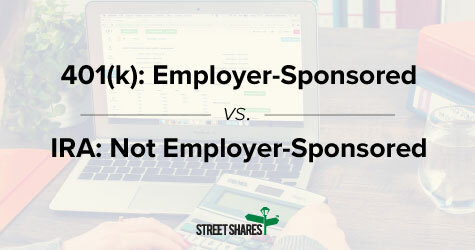 Similar to 401(k)s, the difference between these two is also when taxes are paid. Traditional IRA: When you contribute to a traditional IRA, you contribute from your income pre-tax. You pay taxes on these funds years from now when you start withdrawing money from your account during retirement. Roth IRA: When you contribute to a Roth IRA, you pay taxes on the money now, and invest with after-tax funds. In other words, you’re paying taxes prior to when you contribute to the IRA account. When considering which type of 401(k) or IRA to contribute to, think about your tax bracket and where you see yourself in the future. A Roth 401(k) or Roth IRA has the most impact on those currently in lower tax brackets who anticipate moving into higher tax brackets in the future. If this is you, your contributions are currently at a lower tax rate and distributions are tax-free when you get into a higher bracket. Speak to an investment advisor or tax preparer if you’re not sure how this applies to you. Stocks & Bonds: What’s the difference and how do I invest in them? Even though 401(k)s and IRAs are different investment vehicles, you can invest in stocks and bonds through both. 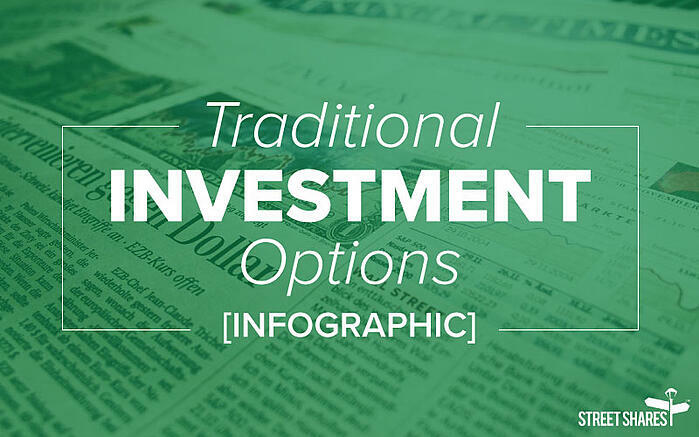 The main difference is that if you have a 401(k), your employer and their investment firm have already set up different types of mutual funds you can select from to invest in, like a menu of options at a restaurant. For an IRA, since you’re managing it on your own with an investment firm, you have more flexibility to choose which stocks or bonds to invest in. 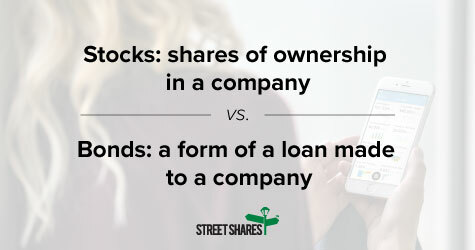 Stocks, at their most basic level, are shares of ownership in a company. As a stockholder, you’re linked to the successes and failures of the company and you benefit if the company’s share price rises or a dividend is paid. Many stock prices follow a rollercoaster path of ups and downs, so most investors benefit from diversifying their investment across shares of many different companies. While you can invest in stocks indirectly through a Thrift Savings Plan (TSP) fund offerings and 401(k) plans, you can also invest on your own with an individual brokerage account or an IRA. For example, you may be able to invest in publically traded stocks (e.g., Apple, Chipotle, AT&T, Ford, etc.) through a traditional or Roth IRA account, or you can always invest with a taxable brokerage account. In sum, stocks can make a great addition to your retirement savings – just understand what type of account you’re using and the risks specific to each company before making your decision. Bonds should also be considered alongside stock investments for your retirement planning as bonds offer great diversification benefits for your portfolio. One of the biggest considerations between stocks and bonds is understanding the tradeoff between risk and return. While stocks make the buyer a partial owner of the company and offer the potential for large, outsized returns, bonds work in the opposite way. Bonds are a form of loan made to a large company, which the company promises to pay back with a set amount of interest. This agreement essentially makes the buyer a lender, rather than an owner. Bonds are typically considered to have lower risk than stocks, because they don't rely on the ups and downs of the company in the same way. Typically, bonds often pay back the full amount of principal. While they might have somewhat less risk than stocks, this also means that there is less available potential for higher rates of return that some stocks can provide. StreetShares has an investment specifically designed to assist veteran entrepreneurs to grow their businesses while you, the investor, have the opportunity to build your savings. While Veteran Business Bonds may not be listed as an option in your 401(k) or IRA, StreetShares is the nation’s first and only small business funding community qualified by the SEC to offer to all Americans the ability to invest in main street and veteran small businesses. With Veteran Business Bonds, any U.S. citizen can open an account with as little as $25 and up to $100,000, earning a flat 5% interest rate over the course of a year. StreetShares uses these funds to make loans to veteran-owned small businesses all across the country, creating a unique social and community lending opportunity. 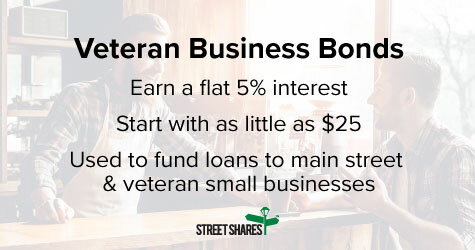 While some large mutual fund companies have large minimum investments, with StreetShares you can start investing with just $25 and can add more money to your Veteran Business Bonds account as often as you like. Our goal is to make growing your savings easy for both the short term and the long term. The more money you add to your StreetShares account, the more you will earn and build your savings for retirement. It’s never too early to start saving for retirement, and there are clearly many options out there to support your retirement goals. Whether you choose to invest in stocks and bonds, or have the assistance of a 401(k) or one of the military retirement pension plans, there’s no better time to start making progress on the mission of retirement than now. For a limited time, you can earn up to $1,000 when you invest in Veteran Business Bonds. Learn more here.